Rackzone is Ireland’s leading provider of shelving and storage solutions, catering for all storage requirements. This includes providing storage shelving, containers and accessories for a variety of different applications including in the workplace, in the office and in the home. Importantly, Rackzone realises the need to cater for all budgets and offer pre-owned storage solutions which give you the storage you require at especially affordable prices. Our second hand pallet racking provides ample storage space for all types of goods and is ideal for use in a warehouse, delivery depot, workshop or similar. Longspan racking is strong and durable and features support bars under each board for additional strength. 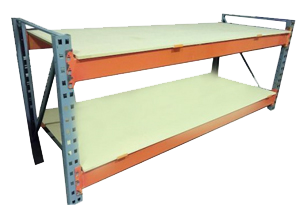 You can purchase second ahnd longspan racking at fantastic prices, giving you quality yet affordable storage. Shelving: We stock a wide selection of second hand shelving bays all of which are in perfect condition and ideal to meet any of your storage requirements. Heavy duty, second hand workbenches provide the ideal, cost-effective solution for any work area, garage, workshop or shed. You can order any pre-owned stock direct from Rackzone and a range of delivery options are also available. To ask any questions about prices, ordering and delivery, just call +353 909673261.